Callum Robinson insists Preston North End’s unbeaten run in the Championship is not something that should be taken for granted. The Lilywhites have overcome their rotten start to the season by going seven games without defeat ahead of Blackburn Rovers coming to town on Saturday. The 1-0 victory at Bristol City last time out, Robinson scoring his ninth of the season, moved PNE up to 18th in the table. They are only two points above the relegation places but now haven’t tasted defeat in the league since the 3-2 defeat at home to West Bromwich Albion at the end of September. And the Republic of Ireland international, who started the draw with Northern Ireland before coming off the bench in another stalemate in Denmark during the break from Championship action, believes it is no mean feat from Alex Neil’s side. “Seven unbeaten in this league is tough to do,” said the 23-year-old. “We managed it last year and got to nine but everybody involved in this league knows how hard it is when games are coming thick and fast. “The points that we grabbed against Rotherham and especially Ipswich really count now. “We’ve then won at Bristol City and they all start to add up. PNE welcome Blackburn and their 5,500 travelling fans to Deepdale on Saturday when the Championship returns after the internationals. It is the start of the run up to Christmas with Middlesbrough to follow on home soil next Tuesday night before a trip to Birmingham on December 1. 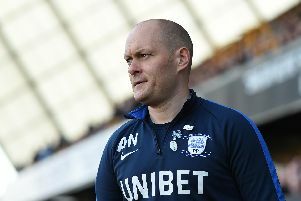 Victory over Rovers on Saturday would bring Neil’s side within five points of their Lancashire rivals who currently sit just two points outside the play-off places. “We’ve got three games in a week when we get back to it and if you get maximum points out of those suddenly people might be talking about the play-offs,” Robinson said with a smile. “That’s how crazy this league can be. Where the nine-goal forward lines up this weekend is a matter of debate. Sean Maguire played through the middle against Bristol City and Ipswich but the hamstring injury that saw him limp out of the Republic’s game against Northern Ireland is being assessed. Robinson or Lukas Nmecha, who starred for the England Under 20s in their win over Germany on Monday, could get the job up top.